Find your pump. Get some help from the configurator. Or just a more general idea of which high-pressure pumps could meet your needs? You’ve come to the right place. Choose which of the three searches below to use, from the simplest to the most detailed. 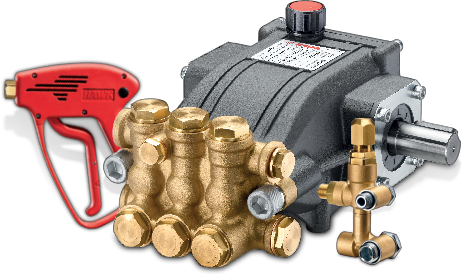 Scroll through the complete list of Hawk pumps available, or enter the name of the model to see all search results. Hawk pumps are used for an endless range of applications. Click on the application that best meets your needs and view all the results available. Search by Pressure and Flow rate . Want to search for a Hawk pump based on technical characteristics? Enter a value for the pressure and/or flow rate. A list of Hawk pumps that meet all your parameters will be displayed. The best industrial high-pressure piston pumps. For more than 30 years the HAWK name has meant one thing: Quality. Long life, low maintenance and high reliability are the normal characteristics of HAWK pumps. Every single component of HAWK pumps are engineered, manufactured and tested to meet and exceed the rigorous demands of the market.